Not only do bell peppers pack more nutrients per calorie than practically any other food, but these crisp, sweet vegetables are as versatile as they are nutritious. While it doesn't take much effort to incorporate bell peppers into your diet, how you choose to prepare them can affect their nutritional value. Bell peppers are a top source of vitamin C, the all-important nutrient that doubles as a potent antioxidant. 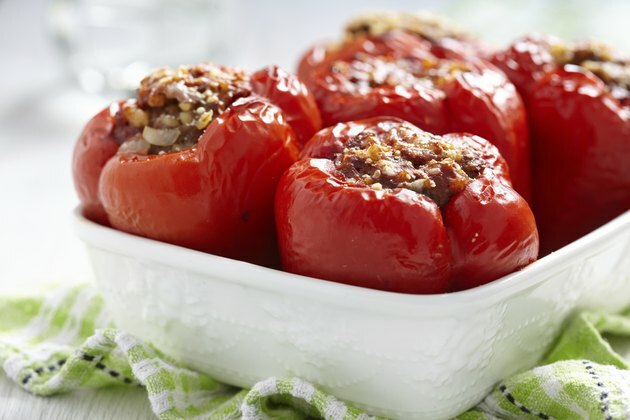 Although red bell peppers are higher in vitamin C than other varieties -- a cup of the raw, chopped vegetable supplies about 317 percent of the recommended daily value, according to the U.S. Department of Agriculture -- even green bells deliver 200 percent of the recommended daily value per cup of raw, chopped vegetable. Because vitamin C is easily destroyed by heat, bell peppers that are cooked until they're tender-crisp will generally retain more of the nutrient than those that are cooked longer. All bell peppers contain notable amounts of beta-carotene, the colorful carotenoid that your body converts to vitamin A. Orange and yellow bell peppers are richer in beta-carotene than the green variety, but red bell peppers are the best source -- the raw, chopped vegetable provides 93 percent of the recommended daily value for vitamin A per cup. Beta-carotene is fat-soluble, meaning it's more readily absorbed when consumed with a small amount of fat. Heat further increases its bioavailability, according to the American Dietetic Association. You'll absorb more vitamin A from bell peppers lightly sauteed in olive oil, therefore, than you would from the raw vegetable. Bell peppers contain several B vitamins, most notably vitamin B-6 and folate. A cup of raw, chopped red bell peppers supplies 22 percent of the daily value for vitamin B-6, while green bell peppers offer slightly less. The red variety is also a better option for folate, providing about 17 percent of the nutrient's recommended daily value per cup of raw, chopped vegetable. Like vitamin C, all B vitamins are water-soluble and begin to degrade when exposed to heat. The American Dietetic Association notes, however, that heat can also make the remaining B vitamins easier to absorb. Bell peppers are a good source of dietary fiber -- a cup of raw, chopped red bell peppers provides just over 3 grams, or about 12 percent of the recommended daily value. Although cooking doesn't affect soluble fiber, it does break down the cell walls that provide structure to insoluble fiber. Sauteed red bell peppers are about 15 percent lower in fiber than the raw variety, while the boiled vegetable is roughly 40 percent lower in fiber. Eating bell peppers a few times each week -- sometimes raw and sometimes lightly sauteed -- is probably the best way to maximize the vegetable's key nutrients. Serve julienned bell peppers with other raw vegetables, hummus and some fresh fruit for a light lunch. Toss raw diced bell peppers into a cold pasta salad, or stir them into a chunky homemade salsa. They're also an ideal ingredient for virtually any stir-fry. No matter how you prepare them, however, bell peppers are bound to make any meal more nutritious.